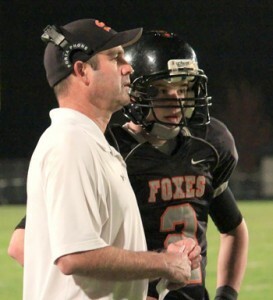 Before the season started we reported on the John Mannion lead Silverton Foxes. We knew they were going to be good, but didn’t know they were going to be dominant. They have beaten opponents by a combined score of 253 to 54 while pitching three shutouts in seven games. Silverton currently sits at (7-0) with Head Coach Mannion being the father of Oregon St starting QB Sean Mannion, and having a special young QB of his own in Cole Chandler (6-1 175 So. QB). Chandler is one of the top sophomore quarterbacks in the region, and will obviously benefit from the high end coaching he receives. He has gone 53/101 for 812 yards with 7 Tds/4 Ints through 6 games. He is learning the ropes and has done a good job managing the game. Mannion says, ” Cole’s a talented kid and has shown that he can be a good leader at a young age”. 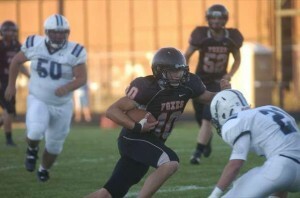 The Foxes actually have two talented QB’s with backup Jonas Dahl being the starter last season. ” Jonas has been great, he’s a quality QB and has maintained an outstanding attitude”, Mannion said. Dahl has been playing receiver and every special teams position. If we are talking Player of the Year then the man you are looking for is RB/LB Chris Garcia (6-0 200 Sr.). The kid has been phenomenal on both sides of the ball, and recently was ranked our #1 Defensive Player for the 5a classification level on the “Mid Season POY Watch”. He has also rushed for 687 yards and 11 Tds through 6 games, making him one of the top offensive players state wide as well. Garcia is a 3 year starter who earned second team all league honors in 2011 at LB, and has absolutely gone off this season. Preston Kirk (6-1 175 Sr. WR) has been the other kid who has really stepped up and become one of the top receivers at the 5a level. 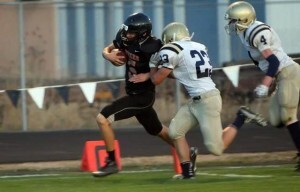 He has 29 of the teams 55 receptions for 443 yards and 4 Tds. He also had a big time performance against top ranked West Albany two weeks ago, catching 7 passes for 134 yards and 2 Td’s. One of the most exciting aspects of this 7-0 team is the fact that they are young. At times they have all five underclassmen starting on the line . ” The team as a whole has done very well, and they are just a great group of kids”, Mannion said. ” Matt Willis (6-3 210 Jr. DE) and Cody Gubbels (6-2 240 So. OL/DL) are a few kids that have really stepped up just to name a few”. Senior Nick Teubel (5-8 170 Sr. DB) is a two way threat and currently leads the team in INT’s, while junior LB/RB Max Wilson (5-11 200) is ranked as one of the top backers in Oregon for the 2014 class. The entire town has bought in to what Coach Mannion has done and they are now reaping the rewards. Its been a win win for the State of Oregon as the Beavers scored big with QB Sean Mannion, and his father leading Silverton. The number of players at the school out for football since Mannion arrived has more then doubled. The atmosphere has been electric, and people within the town are excited. We will continue to keep tabs on the Foxes, as it looks like they could enter the playoffs at 9-0 and be very tough to beat moving forward.